Observe symptoms and patterns, document what you see with pictures while inspecting the plant. Visit our Digital Photography page for some guidelines. Before submitting a sample, consider submitting digital pictures and contacting us (email/ call), so we can guide you on the type of sample we recommend submitting. When submitting cankers, include portions of the branches at the border between discolored and healthy bark (see photo). For some diseases, even though the symptoms are observed in the leaves, the pathogen is located in the root and crown. Contact us with photos at pidc@iastate.edu, and we can tell you if we recommend sending a sample of the plant root ball and crown. 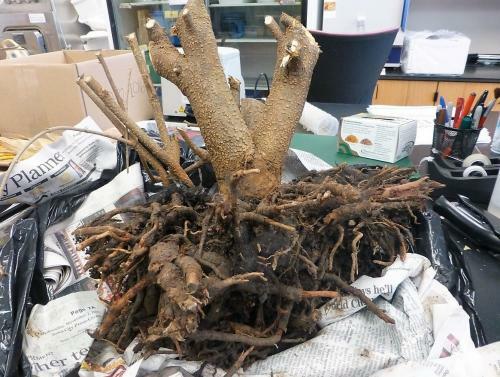 For root rots and crown root confirmation, digging the root ball (see photo below) and send it along with some stems. The root ball and crown is the best tissue for us to recover (isolate) the pathogen. Do not add paper towels or water along with the sample. Excess moisture can cause rapid deterioration of the sample and the proliferation of secondary organisms. Pack your wrapped sample tightly in a box. Ship the package early in the week via overnight delivery. Walk-ins are welcome! 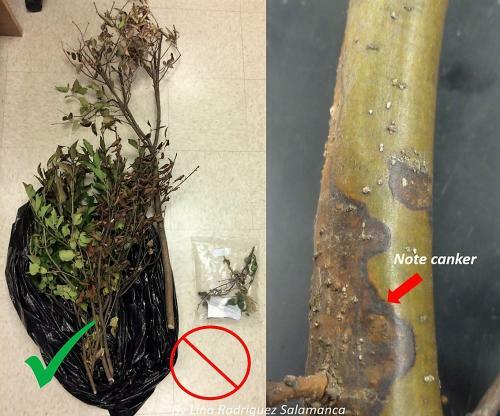 Collect samples from branches that are showing symptoms but are not dead. Include branches and twig with leaves attached. Branch specimens should consist of 4 to 6 pieces, measuring 6 to 8 inches long, and 1/2 to 1 inch in diameter (verticillium wilt) and at least 1-inch thick (oak wilt and Dutch elm disease). Check for vascular discoloration when collecting samples and include branches with sapwood discoloration. 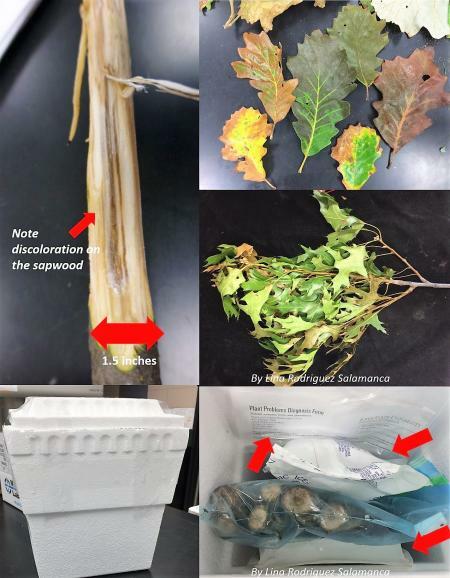 Suspected oak wilt samples: check our video below and use our oak wilt sampling checklist here (https://hortnews.extension.iastate.edu/oak-wilt) that follow the forest service instructions. Send the samples overnight and include ice in the packets around the sample (see photo, important for oak wilt testing). Refrigeration is crucial, lack of refrigeration increases the chance of false negatives. Oak wilt packaging example. (Top left) sapwood discoloration. (Top right and middle) symptomatic leaves. (Bottom pictures) note the icepack (red arrows) on each side of the branches in the bag. Note submission form filled and enclosed in a separate bag. Oak wilt (Only offered between June- October 1st). Cost: additional $30+ Standard fee, total cost $50 *Time to result: 10 business days. *follow instruction for oak wilt sampling. Especially recommended for oaks in the white oak trees (lobed leaves), and all oaks after mid-September. This service needs to be performed at sample arrival.